Getting to Know: Marketing - Enova International, Inc.
How did you come to work at Enova? After graduating from Indiana University, I moved to Milwaukee to work for Kohl’s Corporate. After three years as a “Sconnie,” I was ready to move back to Chicago to be closer to friends and family. I found the U.S. Marketing Analyst job posting on LinkedIn. I talked to the head of marketing at length about Wisconsin, and the job opportunity at Enova, which made me feel more than welcome to come to town for interviews. After a day at the office, I received the offer, and a few weeks later was a resident of Chicago and a new member of the U.S. Marketing team. What do you do at Enova? 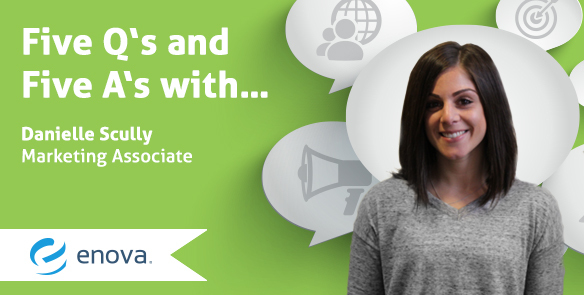 I started my career at Enova as a Marketing Analyst on the U.S. Marketing team, managing the Leads channel. I was then promoted to Marketing Associate and took on the Affiliate channel (for a short while) and the Call Transfer channel. After 2 ½ years on the U.S. team, I had the opportunity to “cross the pond” to the UK Marketing team. I now manage Email and Customer Retention for the UK P&L. What’s the best part of working at Enova? Flexibility — in every aspect. Work attire, working hours, the ability to work from home when you need to, learning opportunities, and the ability to change roles without changing companies. Give me a vineyard in Tuscany, stat! Pizza, wine, sun…what could be better? What are your top three desert island must-haves? I’m not trying to be on a desert island for long, so there’s only one must-have for me…a helicopter to lift me out of there!